With New Mexico’s politics trending hard left, what is a fiscally conservative think tank that focuses on New Mexico’s still-shaky economic situation to do? Quite simply, there will be more to do than ever. For starters, New Mexico’s $1.1 billion oil-generated surplus brings both opportunity and peril. The Rio Grande Foundation has long called for reform of our state’s broken and politically manipulated gross receipts tax. The surplus is an opportunity for legislators to reform a broken system in ways that make New Mexico’s tax structure economically competitive in ways that encourage businesses to stay in New Mexico. Of course, we’d love to see New Mexico households given tax relief as well, but given the political winds in Santa Fe, revenue-neutral reform is likely the best we can hope for. While the massive growth of oil production in the Permian Basin has generated optimism about New Mexico’s future we all have a stake in spending that money wisely. It is worth noting here that oil markets are fickle. They rise and fall quickly. It is unwise to put “permanent” new government programs (or tax cuts) in place based on oil revenues. On that note the Netflix deal is no reason to eliminate the $50 million film subsidy cap. Unlike most economic development programs the film subsidy is NOT a tax credit. It is taxpayers’ money that reimburses film companies 25 percent of what it costs to film a movie and 30 percent for television shows. The Netflix deal CAN be a big win for our state if the cap remains in place and payouts remain strictly controlled. The New Mexico Film Office’s own 2014 report showed that film subsidies returned just 43 percent of what was spent to state and local coffers. While the Rio Grande Foundation has always opposed film subsidies, if Netflix makes New Mexico its film hub without digging further into taxpayers pockets, the industry could wind up being a winner for the state. Eliminating the subsidy cap could cost taxpayers hundreds of millions of dollars annually and would make budgeting in the Legislature a real challenge due to volatile annual expenditures. To reform government and create jobs the Legislature should use former Gov. Susana Martinez’s occupational licensure executive order as a guide for reducing unnecessary burdens on workers and consumers. This is another bipartisan reform idea as the Obama Administration urged (and offered a road map) for states to enact reforms to make it easier for workers to get work without unnecessary and expensive government permission slips. All provisions of the order should be considered for legislative approval, thus giving them a permanence that they currently lack, but the “consumer choice” concept is the most important. This innovative idea would allow a person to practice without a state license as long as his or her employer informed prospective customers of the lack of a license. 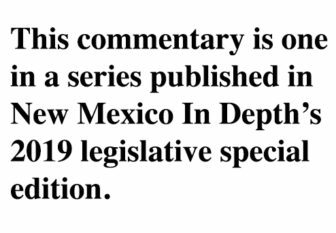 Finally, the issue of New Mexico’s utilities and how they are regulated and managed will be critical in 2019. PNM is looking to get out of the San Juan Generating Station. This despite the fact that a whopping $500 million in scrubbing technology was just invested in an effort to clean the plant’s emissions. Unfortunately, if San Juan Generating Station is mothballed it will come at the cost of the utility’s customers throughout New Mexico in the form of significant increases in utility rates. If Gov. Michelle Lujan Grisham and the Legislature follow through on their pledge to raise the renewable mandate on PNM and other utilities to 50 percent by 2030, PNM will use that to justify the rate payers’ bailing them out for their “stranded costs.” This could cost anywhere from $150 million to $800 million (PNM is being cagey with the actual “stranded cost” number). Of course this doesn’t even include the job and tax revenue losses felt on the Navajo Reservation and other various school districts and taxing authorities in the Four Corners. The San Juan College president estimates it will lose $2 million from the closing alone. The “blue wave” of 2018 will have major impacts in New Mexico politics. With great power comes great responsibility. Paul Gessing is the president of New Mexico’s Rio Grande Foundation. The Rio Grande Foundation is an independent, non-partisan, tax-exempt research and educational organization dedicated to promoting prosperity for New Mexico based on principles of limited government, economic freedom and individual responsibility. The views in this column are the author’s alone and do not reflect the view or opinions of New Mexico In Depth.